Students will firstly receive an introduction to safety and hygiene in the kitchen. This will be linked in with how to eat a healthy diet. They will develop their cooking practical skills, organisation skills and subject knowledge of the Eat well plate to whilst producing a range of cold and cooked dishes. Homework: Organisation and collection of cooking ingredients. Students often find the clearing up process very difficult at the end of a food practical lesson. The more practice they can have in washing up and how to wipe down surfaces so that they are clean is very helpful in supporting them in their lessons at school. Researching and discussing a variety of dishes centred on healthy eating, encouraging pupils to practice and trail recipes at home. Students will learn to work in in textiles, mostly felt. They will practice both a running stitch and blanket stitch and how to sew on a button. They will begin by testing and learning hand sewing techniques. This will then progress to a design and make project, where pupils will design and produce a fully functioning a pair of slippers. They will utilise stitches and materials that they have already experienced through the testing stages. They will be encouraged to be creative and design fun outcomes. Homework: Students will be given a detailed textiles product analysis task. Students will also be asked to research and bring in a pair of their own slippers or a stitched toy from home. Students may bring their textiles home to continue with the sewing, especially if they have missed a lesson. How to help: www.technologystudent.com Google images to search for ‘handmade felt toys or slippers’ or ‘funky slippers’ both of which bring up good images to inspire their ideas. Students will gain further cooking and preparation through practical skills by making a variety of dishes linked to a broad range of animal products. They will learn about specialist diets including vegetarian and vegan. Based on this they will produce dishes using ingredients such as meats, eggs and dairy products. Homework: Provision and organisation of ingredients for dishes. Students will be building upon their safety and hygiene in the kitchen knowledge. Whilst producing a range of cooked dishes they will look into the ethical considerations of food, sustainability issues and where their ingredients and food comes from. Students will also look at the manufacture of a variety of foods such as diary production. Homework: Organisation and collection of cooking ingredients and ensuring that these are brought into lessons. Students will be completing a design and make textiles project to create and produce a phone or tablet protective case. 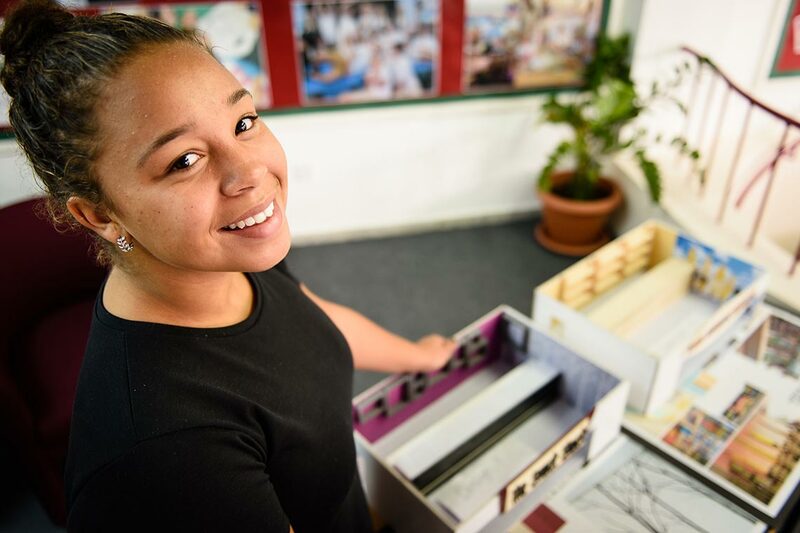 Students will build upon existing textiles skills of hand sewing and develop new skills through use of the sewing machine to manufacture their final design. Students will learn how to set up, use and troubleshoot issues using the sewing machine. They will produce a quality produce that is functional and usable. Homework: Students will carry out research at home using the Internet and other secondary sources to complete a product analysis of an existing phone or tablet case. Students will continue to build upon their learning of the preparation of cooked dishes. Whilst producing quality dishes students will learn how to select and prepare savoury dishes using a range of starchy carbohydrates, vegetables and dairy products. They will look into sources, seasonality and characteristics of dairy products. They will also continue to learn to work safely and hygienically within the kitchen. Homework: Organisation and collection of cooking ingredients. The focus of the students cooked dishes will be fruit and vegetables. Student will cook a range of main meals and sweet dishes, such as cakes using fruit and vegetables as a basis for their learning and practical skills. Towards the end of the project students will complete a small scale GCSE design and cook project of their own choice based on a suitable meal with two servings using fruit or vegetables. Homework: Organisation and collection of cooking ingredients. Research their choice of final examination dish. Pupils will be completing a Graphic Design project based on perfume and aftershave products. They will look into packaging, net design, 3D drawing techniques, rendering and typographical logo design. Pupils will creatively produce their own branding and marketable product. Pupils will prepare their cooking skills to GCSE standard and learn a range of cooking methods. Skills will include pastry making, working with fish, bread making and cake decorating. Pupils will also gain an understanding of costing, portion control and the nutritional information and value of dishes they cook. Pupils will complete a coursework project investigating the process of thickening of sauces. They will research a variety of methods and types of sauce. Students will learn which establishments provide food and drink and the style of service available. They will learn about roles, duties and training suitable for various roles both nationally and internationally. How to adapt an existing recipe to create the perfect outcome in texture and taste. Students will learn the importance of presentation and a variety of theory linked to food and nutrition. Students will experience and learn a range of medium and high level skills through cooking practical lessons. Skills including the creaming and rubbing in methods, baking, grilling, frying, sauteing and many more. 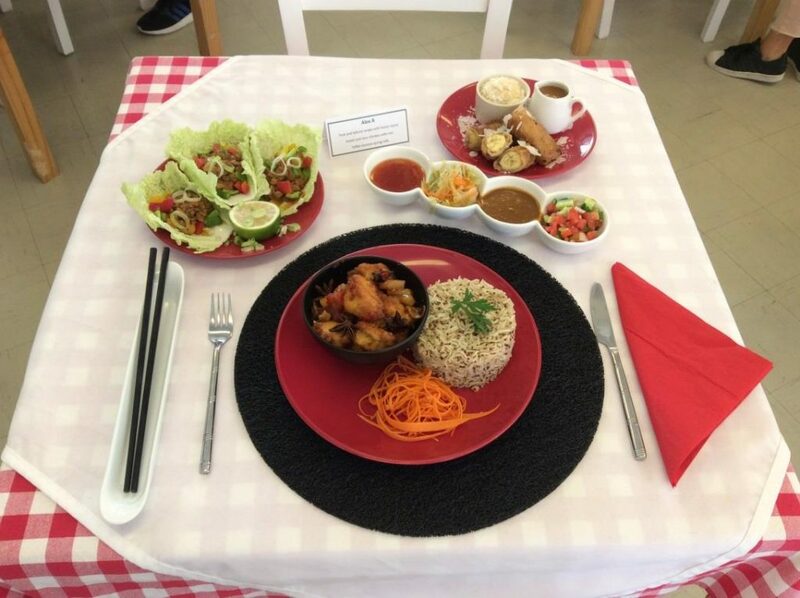 Pupils will be completing coursework based on a 3 course menu for an International Restaurant. Alongside this they will learn the functions and sources of the main nutrients and current healthy eating guidelines. Students will experience and learn a range of medium and high level skills through cooking practical lessons. Skills including four main methods of cake making and a focus on varieties of pastry and bread dough making. Homework: Set past paper exam question within their GCSE homework booklet and preparation of ingredients for practical sessions. They will develop an understanding of menu planning including for specialist diets, such as dishes suitable for the elderly and vegan diets. Alongside their coursework students will develop their practical skills further through presentation and developing menus. They will also carry out external research including television cookery programs, recipe books and visits to restaurants or takeaways. They will also complete their International cuisine controlled assessment and have a whole day practical examination which covers the previous terms’ prior learning. Homework: Set past paper exam question within their GCSE homework booklet and preparation of ingredients for practical sessions. Typing up elements of their controlled assessment coursework. This term will involve a heavy focus on theory and revision of Food Nutrition and Preparation including completion of all past papers.